With the nice weather break I actually got to fish three out of four days. Started out on thursday with Wes Wood and his crew we hit up the shallow rig for some hardtails and then rolled south in the 2 foot chop. Hit the first floater and pretty quickly put a 60 pound fish in the boat and then right after a 30 pounder on live hardtails with 80 pound frenzy flouro and 7/0 circle hooks. The fish were hanging tighter to the rigs then normal which led to some cuda problems. The action slowed so we headed further south to try some new rigs out. 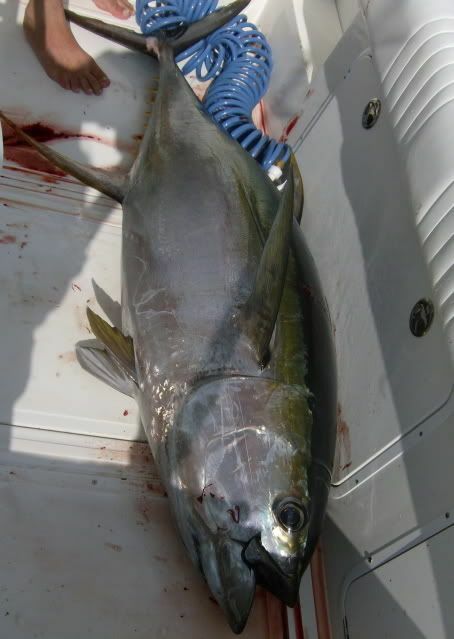 The bite out there was ok as we jigged up some 20 pound yellowfin and caught a 90 pounder on the chunk to finish off the day with six yellows in the box. I also fished on on saturday with Michael Pennachio and his bro-in-law and father-in-law Red Phillips. We hit up the close in floaters again and this time they were dead so we really rolled long out to a new drillship about 66 miles out the pass. There were big fish out here slow rolling everywhere but not very hungry. At 11 we hooked a 60 pounder on the chunk and put him in the boat and about 30 minutes later we hooked a 125 pound fish on a live mullet and put him in the boat and then the action just died out to nothing. Sunday proved to a be a brisky day but Chris Turners group and I rolled out anyway to a rig a little to the west of where I had been fishing and proceeded to get on the fish. Within an hour we had put three good yf in the boat on live bait before the amount of boats that showed up had pushed the fish deeper. 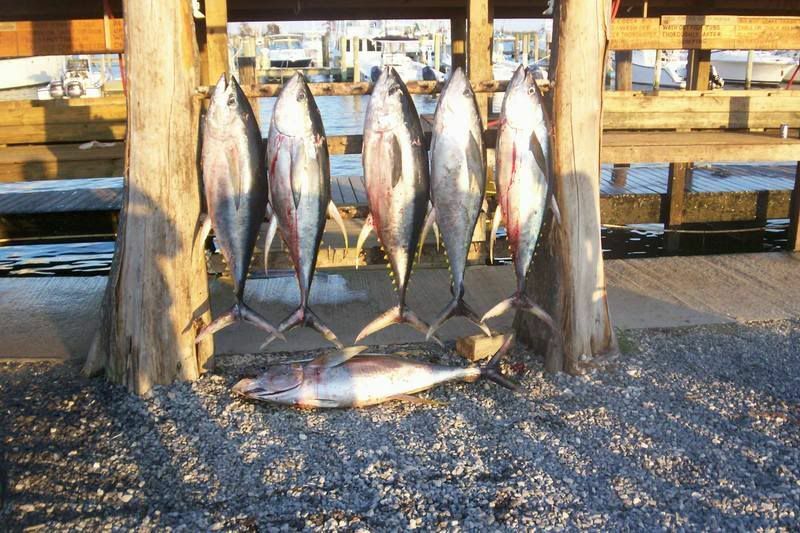 We decided to chunk up some small tuna and added three more fish to the box. 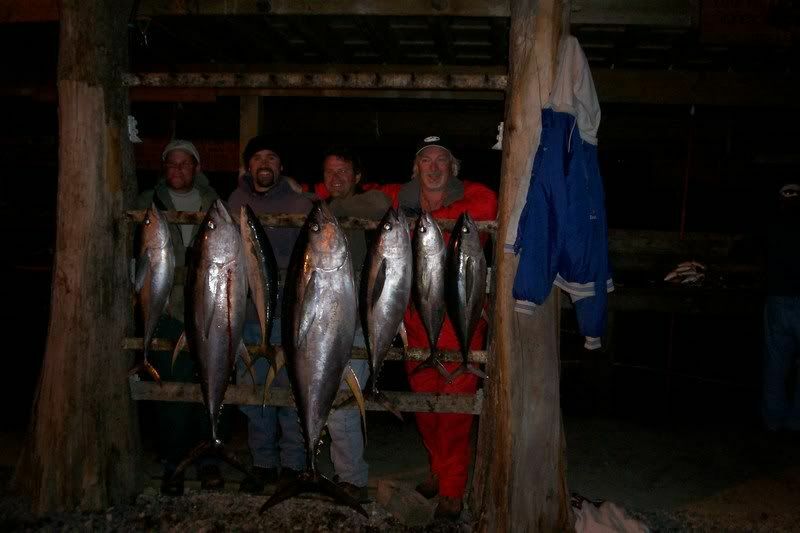 All the tuna were between 60-70 pounds and were definitly fighting with an attitude.